Let’s travel to ancient Rome to explore the theme of natality by focusing on birthing – the natal event in which a new person enters the world. As a result of each natal event is that the world is forever changed; it can never be the same again. My lens is focused narrowly on parturition from the perspectives of the mother and the midwife who brings a child to light. Like Janus, I look back to the Roman culture of antiquity for mythology and ritual related to childbirth and midwifery, and I look ahead in time to note the diminished role of midwifery in contemporary Rome. One of the practices of ancient Roman culture was to secure patriarchy by recognizing legitimate children born in legal marriage. The myths and rituals related to childbirth recognized the risk that women undertook to ensure the continuity of the human community. It also reflects the cultural value placed on child development, a value that is reflected in the Montessori Method and Italy’s current system of nursery schools. Italian immigrants arrived in Canada in the early 20th century, bringing their midwives with them. There were three factors that supported the continued use of midwifery among Italian immigrants: personal preference for midwives, lack of doctors who spoke Italian, and lack of funds for hospital births (Declercq & Lacroix, 1996, p.386). In Rome today, the medical profession manages the risk of childbirth while midwives struggle to be recognized as a legal occupation. Prior to the medicalization of childbirth in the 1950s and 1960s, Italian midwives had professional autonomy in community-based practices and enjoyed the respect and confidence of the communities they served. After the 1960s, midwives became hospital employees subject to medical supervision: “The control exercised over pregnancies and labour by gynaecologists destroyed the individual relationship established over time between women and their midwives.” In 1978, Italy introduced deep changes to the health system which further reduced Italian midwives autonomy and function and in 1999, a new health reform law abolished midwives “professional” status (Spina, 2013, np). This massive culture change took only fifty years and illustrates Haarmann’s postulate: “If innovation is the product of a thinking oriented exclusively toward technological advance, then the knowledge that is constructed upon it defies the appreciation of the usefulness of knowledge related to natural phenomena and is in conflict with it” (Haarmann, 2007, p.259). Recognizing that birthing was a high risk event, the ancient Romans created a pantheon of spiritual helpers to protect mother and babe at every stage of parturition and child development. Juno Lucina was the primary deity of childbirth and she was invoked for an easy delivery and healthy child (Figure 13). When parturient mothers invoked Juno Lucina, they let their hair down and loosened their clothing to symbolize removal of constrictions that might obstruct labor. 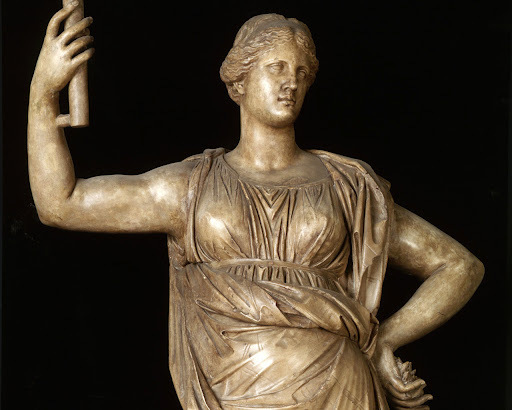 Juno predates the founding of Rome; she was a deity familiar to many ancient Italian cultures. Many cultures have deities who preside over childbirth in recognition of its risk and its importance to cultural continuity. In North African cultures, Tanit/Neith, as Opener of the Ways, opens the cosmic pathways so that new soul could be born (Iles, 2007, np; Griffis-Greenberg, np). This function was also assigned to Greek Athena. Other Greek goddesses of childbirth were Artemis, Hecate as midwife, and Eleithyia who wields a torch or raises her arms to summon a child to the light. On Malta and in Carthage, Juno Caelestis was merged with Tamazight Tanit and Canaanite Astarte in the cultural transition from Canaanite (Punic) era to the Roman era because the three goddesses presided over births and were associated with light (Stuckey, 2009, np). Childbirth is a primary function of Buryatian Umai and Hindu Uma. Ixchel is a Mayan goddess of childbirth, lunar cycles, and pregnancy. Pi-hsia-yuan-chun is a Chinese goddess who presides over birth. Tamayorihime is an ancient Japan Sea Goddess who watches over the birth waters to ensure a safe delivery. Yemaya is a Nigerian Goddess Of Beginnings and Mother of Waters who watches over the birth of children and protects children during childhood. Freyja is a Nordic goddess associated with easing childbirth. Ninhursag is the Sumerian Womb Goddess and midwife of the gods. Sheela-na-gig means ‘to open’. Bring flowers to the goddess: in flowering plants this goddess delights. Garland your heads with delicate flowers. (Ovid [Fast. 3.253–258] trans. by Dolansky, 2011, np). 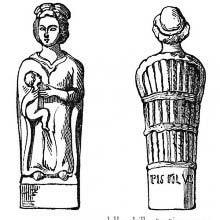 The temple and grove on the Esquiline were linked to several rituals related to childbirth. A Roman father donated a coin at Juno Lucina’s temple, in accordance with an ancient ritual begun by Servius Tullius in the sixth century BCE. The Matronalia festival on March 1 honoured motherhood and on that day, married women made procession to the temple to Juno Lucina (Dolansky, np). When a woman entered labour, it was custom to place a key, symbol of Janus, in her hand with the aim of ensuring an easy delivery (Figure 14). Janus is the keeper of gates; he guards all passages, particularly those related to time and motion. At parturition, he is invoked to open the birth passage. Language is the most complex of signs, so I chose to focus on the layers of meaning in the word “Lucina”. Juno Lucina, Goddess of Childbirth, brings a child into the light. ‘Lucina’ derives from Latin lux, which means “light” or “daylight”. Other words from this Latin root are lucid and luminous. Some scholars suggest that Lucina is derived from lucus, meaning grove, because her grove had an ancient and celebrated tree at which offerings were made after a birth, but this interpretation limits Juno Lucina to Rome. I accept that Lucina derives from lux meaning light. Furthermore, Lucina is an epithet for Diana in her capacity as a childbirth goddess, and together Juno and Diana Lucifera are sometimes known as the Lucinae. If cumulative cultural knowledge is concentrated into myth and handed down from one generation to the next, then the ancient Romans compiled their scientific and psychological knowledge about the birthing process and concentrated it in a body of myth that was used for generations by birthing mothers and midwives. Here are some of the many deities that played a role in the birthing process. Juno Lucina, Goddess of Childbirth, is the primary deity presiding over the delivery and is responsible for bringing the newborn to the light. Diana, the Roman equivalent of Artemis, is Opener of the Womb and watches over childbirth (Gimbutas, 1999, p.156). Carmenta, patron of midwives, arrives with Prosa, Postverta and Egeria. Together, they are known as the Carmentae. Prosa assists in normal births when the baby presents head first and Postverta assists if the baby presents breech. Egeria determined the fate of the child. Parturient mothers and midwives made sacrifices to the Carmentae to petition her to bring out the baby without difficulty (Turcan, 2001, p.19). The Parcae are three goddesses of fate related to birthing. Nona and Decima determine the right time for birth, assuring the completion of the nine-month term while Partula oversees partus, the initial separation from the mother’s body. Levana, like Artemis, is the goddess who aids the midwife in lifting the baby and laying it on the ground where the midwife cuts the umbilical cord in a symbolic ceremony of connection to Earth. Vaticanus ensures the baby’s first cry. While the midwife swaddles the child and presents it to the mother (Calame, 2001, p.167; Turcan, 2001, p.20), Juno Februa delivers the woman of the placenta (Turcan, 2001, p.19). The Roman pantheon had deities to help a mother nurse her babe, to strengthen the baby’s bones and to teach it to eat and talk. Just as Umai watched over a child’s first years, Roman deities protected and assisted a child to ensure healthy development. Haarmann postulates that mythology is cultural knowledge that endures intergenerationally when it demonstrates usefulness (Haarmann, 2007, p.204f). The ancient Roman myths of birthing deities demonstrated usefulness for generations because they were a repository of the culture’s scientific knowledge about the birthing process. Basilica Maria Maggiore, Rome. Photo by Wolfstone. Superposing Christianity on ancient Rome would have altered birthing and midwifery practises. By 337 CE, paganism was criminalized. In 371 CE, the Edict of Intolerance permitted persecution of pagans and destruction of temples. By 431 CE, Christian leaders, realizing they could not eradicate pagan devotion to female deities, elevated Mary as “Mother of God”. 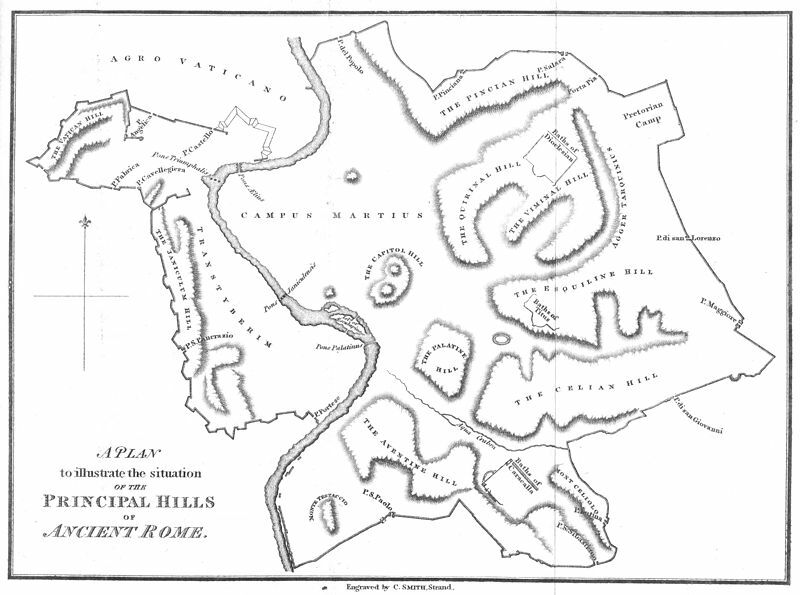 Churches dedicated to Virgin Mary were built on the sites of the demolished goddess temples: Basilica Santa Maria Maggiore (432 CE, see photo) occupies the site of Temple to Cybele near the former Temple to Juno on the Esquiline (see map below). Basilica Santa Sabina on the Aventine (432 CE, see map below) is located adjacent to the site of Temple to Juno Regina and appears to have re-used 24 marble columns from that temple. Is Mariology merely a thin veil overlaying the ancient cosmology of the Great Mother – a covert syncretism? When Arendt focuses her philosophy of natality on politics in the public sphere, she “places it within a masculinist tradition” (Tyler, 2009, p.1). She viewed women’s labour in childbirth as hidden in the private sphere of the household. Imogen Tyler breaks with Arendt when she writes, “Birth has been systematically disembodied and appropriated by scientists, philosophers and artists.” (p.2). Tyler answers Arendt by rethinking birthing from the perspective of the public sphere. She observes that women are no longer confined to the private sphere, but they can enter the public sphere of employment or politics only by splitting and disavowal of their maternal capacity and responsibilities (Tyler, p.2). Tyler’s thesis is that feminism needs to find ways to hold birth and those who give birth at the centre of politics (p.3). She advocates the use of art in public places, particularly medical places, to indicate “a political aesthetic in which the birthing woman is resolutely the active subject and not the abject object of the birth scene” (p.4). This type of ‘coming out’ has the effect of ‘bringing to light’ – making public that which was private in order to give it voice. Tyler’s innovative notion of matricentric politics needs a matricentric cosmology in order to give it coherence in contemporary Western society where patriarchy has become increasingly covert. Naomi Goldberg argues that a simple lie must be maintained for patriarchy to function. “This lie is the denial of the womb that gives us birth. The lie of patriarchy is that the Father is the only true parent” (cited by Christ, 1997, p.67). The patriarchal lie that the mother is merely “the furrow for the seed man plants was ‘repeated by Aristotle and influenced western scientific views for centuries” (Christ, p.65). In summary, the scientific knowledge of the birthing process was contained in the mythology of birthing deities. The value on healthy child development embedded in the ancient myths is alive in contemporary culture, in spite of the medicalization of childbirth. What were the value and knowledge shifts that caused Roman culture, like other Western cultures, to relinquish birthing to an impersonal and secular medical system? I conjecture that the contemporary culture of Rome places its faith in the medical system because it produces a higher rate of natality or live births. When mythology is used as a repository of scientific cultural knowledge, it requires continual critical thinking and renewal in order to remain current, relevant and useful. 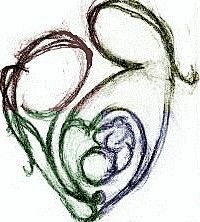 Failure to refresh the body of myth with new knowledge about birthing would reduce the usefulness of the myth in the birthing process. Failure by midwives to apply critical thinking to birthing myths could manifest as superstition. An outdated science performed in blind faith could deteriorate into superstition, similar to the blind faith of Christian fundamentalism that resists critical thinking by insisting on a literal approach to sacred texts. Temple to Juno Regina on Aventine Hill near current site of Santa Sabina church. Temple to Juno on Palatine Hill adjacent to Augustus’ palace. 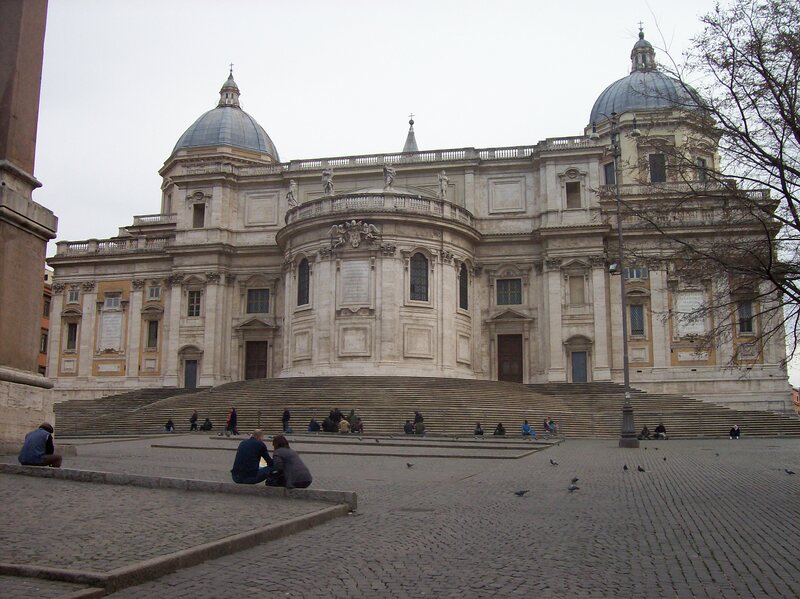 Temple to Juno Lucina on Esquiline Hill close to current Santa Maria Maggiore Basilica.